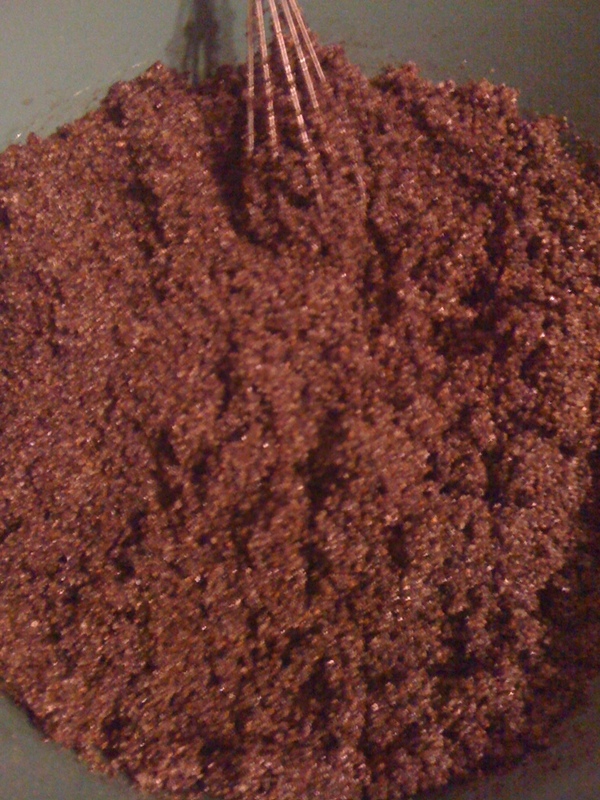 This is a big batch of my new cellulite rub. I found the recipe in my spa book and thought it would be perfect with the mocha facial mask. It’s ground coffee, granulated sugar, dead sea salts, and sweet almond oil. It has a very moisturizing and grainy feel, and has the awesome smell of ground coffee. The coffee FO that I had ordered smells awful, so it’s a relief to have a good coffee product that I can stand behind. Caffeine helps firm and tone skin, the oil is an awesome moisturizer, and the combo is a really nice exfoliant. (Pretty similar to my cocoa scrub, but more of a gentle formula for rubbing instead of the firm grain texture of my scrub.) This batch made nine 3 ounce jars of rub, plus a good amount of test product (too small to sell, but then I can use some. Oh yeah!). I ended up making a few combos where I put the jar of this and a two treatment bag of facial mask in a coffee mug. The rubbing motion is what does the most benefit for cellulite, in theory. It’ll be interesting to see if it’s very popular at the craft sale.